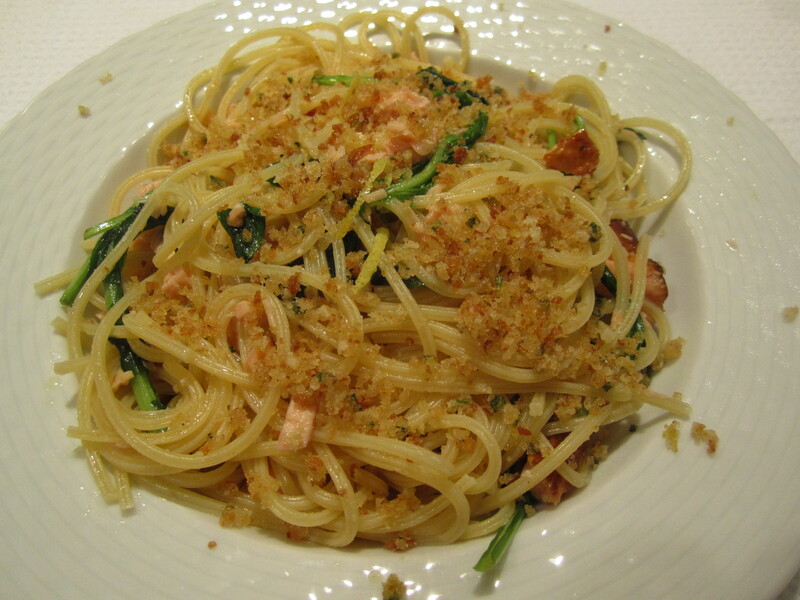 The toasted breadcrumbs are what Italians would use instead of grated cheese to top a seafood-based pasta like this one. These breadcrumbs are made with the scraps of bread that I keep for months on end and pulverize in the food processor. I’ve added garlic, lemon zest, parsley, salt and lots of black pepper to them and the aroma of them toasting is irrestistible. The arugula was grown locally and bought at the farmers’ market. 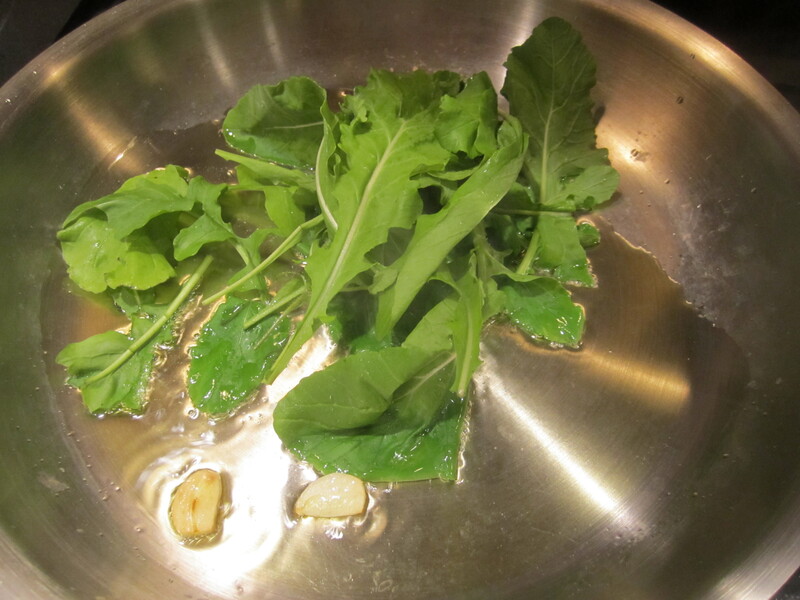 Like winter arugula (even in Florida), it is stronger and more peppery than delicate summer arugula, or baby arugula. Its lemony bite is the perfect addition to a pasta with seafood. I’ve simply toasted a split clove of garlic, added the arugula, then topped with the hot pasta and diced smoked fish. The crumbs get sprinkled on top, and, (like grated cheese) it’s a good idea to keep an extra bowl of them on the table during the meal, since they seem to be the main attraction! 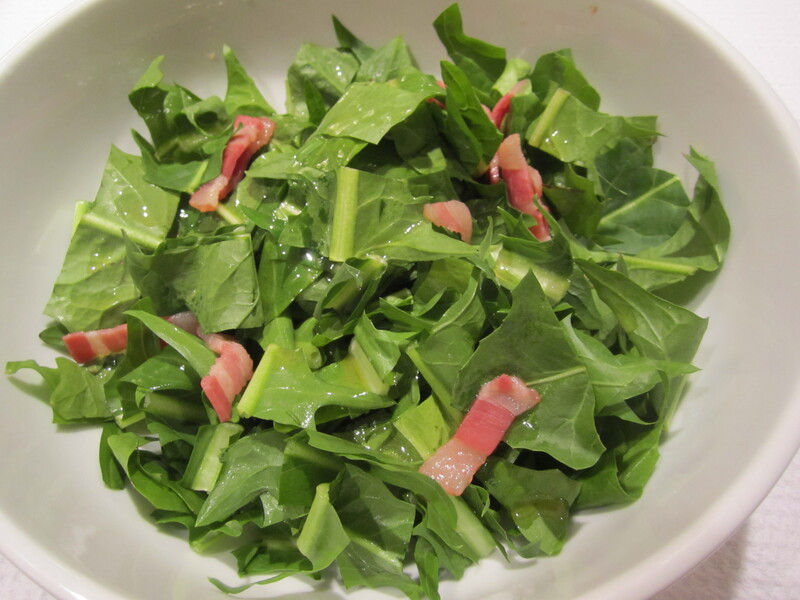 As a salad, I served some wonderful raw Florida dandelion greens with dressing of warm pancetta, olive oil, agave and red wine vinegar. Simply render the pancetta in a tablespoon of olive oil, then add a tablespoon of red wine vinegar and a teaspoon of agave. Pour over greens, toss and top with crispy pancetta. Place garlic cloves face down in skillet with oil. Heat until garlic begins to turn golden. Add arugula leaves and toss in hot oil. Set aside until pasta is cooked. 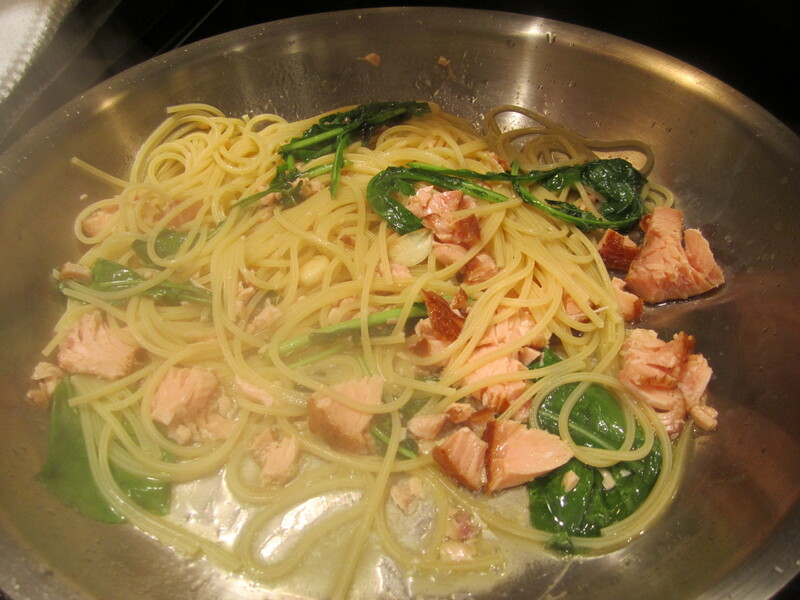 Add cooked pasta, smoked salmon, and a quarter-cup of pasta cooking liquid. Toss over low heat for a minute or so. 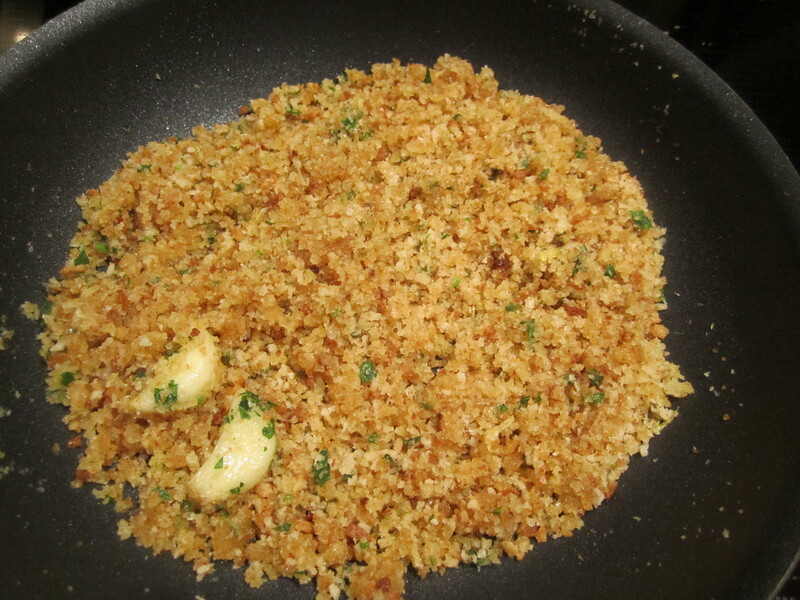 Remove garlic cloves and serve, topped with toasted crumbs. In a nonstick skillet, on medium heat, place garlic halves, cut-side down, and allow oil to warm about 30 seconds, then add breadcrumbs. Stir and toss for a minute until they begin to turn golden. Add lemon zest, parsley, salt and pepper, and continiue sauteing until the crumbs are golden. Do not overcook, as they scorch easily. When they’re done, remove from heat immediately and set aside to cool. Taste and add salt or pepper, if necessary. Remove and discard garlic clove.